Here are some great new books that we highly recommend, each for their own reason. Naturally, we have lots of other new books — just send us an inquiry by clicking on the INQUIRY button at the bottom to ask if you want to know if we have whatever your looking for. As a full-service bookstore, we can’t begin to list all our inventory. but we love making time to chat with our on-line friends. These, though, are some we’re fond of, and think they are the sorts of things many of our readers will be eager to know about. If you are as glad about these as we think you’ll be, use the ORDER FORM link below. Easy. We’ll deduct a 20% off the regular retail price I(which we show) and write back to personally acknowledge everything. 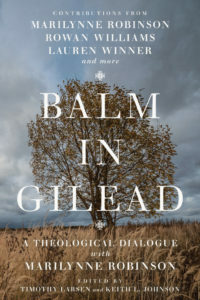 Balm in Gilead: A Theological Dialogue with Marilynne Robinson edited by Timothy Larson & Keith Johnson (IVP Academic) $28.00 Oh my, what a marvelous book, another in the extraordinary collections that are published by IVP from the annual Wheaton College theology conference. Last year the event was a discussion about and with novelists and essayist Marilynne Robinson and it brought together some of our finest thinkers about faith and literature and culture and church and included a response by the notable author herself. (There are contributions here by Rowan Williams and Joel Sheesley and Lauren Winner and Timothy George and others.) This book is the next best thing to being there at the event, and we are so, so happy to get to announce it here. I trust you get the allusion in the title to the Pulitzer Prize winning novel, Robinson’s second, Gilead. 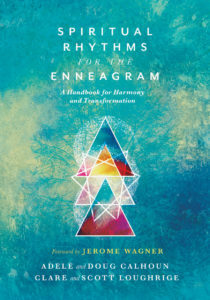 Spiritual Rhythms for the Enneagram: A Handbook for Harmony and Transformation Adele & Doug Calhoun and Clare & Scott Loughrige (IVP/formatio) $24.00 Holy smokes, just when you thought there were enough books on the enneagram and faith formation (well, unless your a 5, and then you can’t get enough) here comes a workbook-sized manual by remarkable folks gifted in creating great resources. (Adele Calhoun did the incredibly useful Spiritual Disciplines Handbook and the powerful, poetic Invitations to God.) Clare and Scott are cofounders of a church where they’ve served for twenty-six years and they are, like the Calhoun’s, are certified Enneagram instructors. In large print on the back it says “You are more than your type.” Hear, hear. 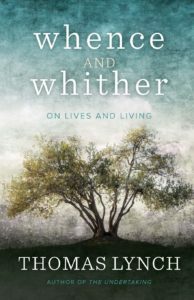 Whence and Whither: On Lives and Living Thomas Lynch (WJK) $18.00 Those who have followed our work for a long time might recall the times, years ago, when I insisted that Lynch was our favorite new writer. His award-winning book The Undertaking: Notes from the Dismal Trade and it’s follow up Bodies at Motion and at Rest helped me when my dad was killed and I was unable to read about grief. But these literary, passionate, deeply moral reflections on being an undertaker blew me away and remain all time favs. His great reflection on his travels to Ireland — Booking Passage and the book he wrote with theologian Thomas Long (The Good Funeral) are stellar. We stock his poetry, too. Because of his groundbreaking work doing solid studies of the role of the “dismal trade” and his splendid writing style, Lynch remains the gold standard in this genre, but lately I’ve read a number of other such books. I loved the spunky Smoke Gets In Your Eyes: And Other Tales from the Crematorium and, last year, Caleb Wilde’s Confessions of a Funeral Director: How the Business of Death Saved My Life. But a new collection from Mr. Lynch is nothing short of a publishing event. This is one of those books that I am sure is so full of whimsy and care and goodness that I hardly dare open it. I have to wait for the right moment as reading this will be one of the great pleasures of this season. I without a doubt commend it to you. Kudos to WJK for producing a lovely, handsome, paperback volume. 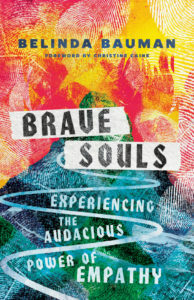 Brave Souls: Experiencing the Audacious Power of Empathy Belinda Bauman (IVP) $23.00 Belinda Bauman is one of our favorite people, even though we’ve only met a few times. You know those rare folks who are confident and honest, who show such interest in you that you realize they have a gift — caring, thoughtful, brave, for real. After a few moments in her presence I was encouraged and blessed and glad. She and her husband, Stephen, have lived all over the world, doing relief and development work and caring for the poor and oppressed in the name of Jesus. As Steven tells it, Belinda was often the energizing force, the one who most readily heard God’s call to risk and serve. They are adventurous people who do excellent work and I’d read anything either of them wrote. This brand new book is on the surface about brave women who are doing extraordinary work, leading the way, doing justice, bringing goodness and beauty and peace to the world. If these stories were all that were in Brave Souls the book would be a winner and you would love reading it. But there is more going on — finally, it is about empathy. She uses cutting edge neuroscience and Biblical parables and insights gleaned from the women she writes about to offer insights about how to be more empathetic. By nurturing this kind of deep care for others, this solidarity with the human condition, we can be transformed — practicing empathy can be a spiritual discipline which will create in us a character of virtue and inspire us to bravery. Belinda Bauman gives us a gift — inviting us away from merely hearing someone to embracing empathy and allowing another person’s story to move us into action. The journey isn’t pretty or easy, but Bauman’s belief in change left me more hopeful than I’ve been in a long time. Do you wish to counter apathy with empathy? Do you need to move beyond “compassion fatigue” and take up world-changing actions? By listening well to others, honoring their own stories (even, maybe especially, among those we distrust and disagree with) we can be the peacemakers God calls us to be. This is a book of great joy and great energy. The cover is a bit busy, but if you look carefully you’ll see some thumb and fingerprints. These show up in the book. You’ll love it. 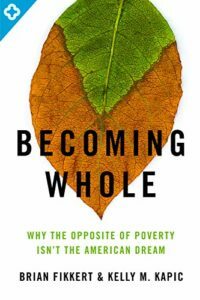 Becoming Whole: Why the Opposite of Poverty Isn’t the American Dream Brian Fikkert & Kelly Kapic (Moody Publishers) $15.99 Why don’t you order a few of these from us right away — it’s that important, and I’ll be mentioning it often this year. I’m sure I will name it as one of the Best Books of 2019. Let me explain. Some of our customers (from a variety of religious traditions and from various social sectors) have greatly appreciated the important volume by Fikkert and his colleagues at the Chalmers Center at Covenant College called When Helping Hurts: How to Alleviate Poverty without Hurting the Poor… There are a few spin off items (one for those going on short term mission trips and a good one called Helping Without Hurting in Church Benevolence: A Practical Guide to Walking with Low-Income People.) These compassionate and savvy books offer a bigger picture than just critiquing toxic charity or affirming free market capitalism as the answer to poverty and offers proposals for faithful, lasting, initiatives. Yet, Fikket worried that there needed to be a better foundation so that readers and those wanting to do good don’t misunderstand God’s call to wholistic development or read that call through the lens of a worldly sort of materialism. There are those who would use, it seems to me, When Helping Hurts to swipe at those doing their best to serve with the poor (locally and abroad) and there are those who have a presuppositional loyalty to free market capitalism, and read everything through that debatable ideology. Fikket, and his theological co-writer here, are Reformed and doctrinally conventional. Their worldview is such that they want to discern the spirit of the age and understand the times in ways that are faithful. We might say they offer a prophetic imagination. And so, they have given us this big, fascinating, deeply spiritual, wonderfully inspiring call to reject the American dream of mere economic growth and materialism. While they may reject some big plans of the welfare state, they are no populists or nationalists. They are shaped by a Kingdom imagination and the Biblical story of God’s redemptive work through Christ. This is practical public theology that is readable and helpful. Of course this is for anyone doing caring ministries, anti-poverty work, economic development, or service for the common good. But I believe it is for any of us — those who are broke and wishing for greater financial health and for those who are people of means wondering what makes for a truly fulfilling life. Why are families and communities increasingly fragment? Why is loneliness skyrocketing? What is mental and even physical health deteriorating? Becoming Whole helps us make sure we aren’t spreading dis-ease and our own brokenness even as we are attempting to make the world a better place. It is a great, important book, nicely designed with two color ink and some nice graphic touches. Good job, Moody! 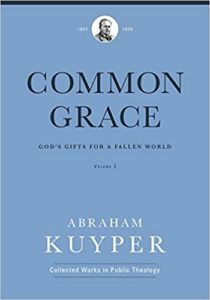 Common Grace: God’s Gifts for a Fallen World Volume 2 Abraham Kuyper (Lexham Press) $54.99 This is the brand new, much-anticipated volume in the ongoing Kuyper publishing project releasing hefty tomes in the “Collected Works in Public Theology.” We stock them gladly as it was in many ways Kuyperians — the fancy word those who stand in the line of the early 20th century Dutch neo-Calvinist cultural leader and public intellectual who reminded us of God’s redemption of “every square inch” of culture and society — who inspired us with a world-and-life vision of faith that led to founding our bookstore the way that it is. That God has given good gifts that can be discerned by artists and scientists and wise ones who are attentive to the glories and structures of creation should be evident; that such wisdom leads to human flourishing by honoring God’s built-in intentions for His creation is a matter of life and death. The best books help us open up and disclose the meaning of history and the point of life in each and every aspect of society. Preacher, theologian, reporter, educator, Prime Minister Kuyper (1837-1920) had much to say about so much of this, positing a set of Christian principles from which might emerge a renewed, just culture (unlike the brutal French Revolution of the previous century) and his old words still speak today. Kudos to those translating his many newspaper essays and lectures and books (sometimes for the first time in English) and for putting them in these handsome, enduring volumes. When a book bears on the back cover compelling endorsements by theologians and leaders like Rich Mouw and Jamie Smith, human rights and inter-faith activists like Matt Kaemingk, jazz players and apologetics profs like Bill Edgar, and Godly, winsome teachers like the legendary Davey Naugle, you should pay attention. I’m just saying. Seasoned Speech: Rhetoric in the Life of the Church James E. Beitler III (IVP Academic) $25.00 Maybe you saw on social media that a week or two ago we sold books at a great C.S. Lewis conference hosted at an Episcopal Church near Philadelphia. With several expert Lewis scholars we had a blast, and a few talked about this seemingly arcane topic that so preoccupied Lewis and his Inklings: rhetoric. In many ways, this is a huge topic — how do we communicate? What makes something compelling? How do we present truth (or what we think is truth) to others? In an age of mass marketing and social media, how do we persuade? Does goodness, beauty and truth go together, and does charm and eloquence and elegance count much in persuading others? What is a Christian view of communication and what might a theologically-aware framework offer as we think about rhetoric? What does that verse (Colossians 4:6) mean about having our speech “seasoned with salt”? Lewis asked these questions, of course. Alas, this book came a few days after that fine event and some there would have loved it. It includes a chapter on Lewis and a chapter on Dorothy Sayers! I assume there are other astute readers of BookNotes who will appreciate just how fabulous this book is. 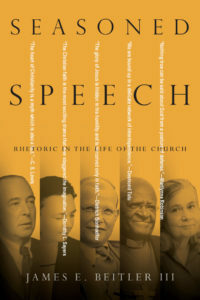 Seasoned Speech looks at five key Christian public intellectuals and analyzes how they spoke and wrote and bore witness Using this embodied case study approach we learn about different options to understand the core meaning of the gospel story and various styles and ways to speak about such things. Beitler invites us to ponder how each may or may not be faithful and fruitful. What a project! Read these endorsements to illustrate further the scope and significance of this amazing work. 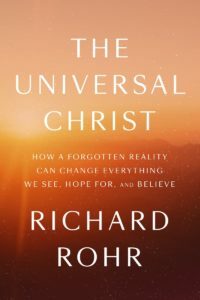 The Universal Christ: How a Forgotten Reality Can Change Everything We See, Hope For, and Belief Richard Rohr (Convergent) $26.00 Okay, I’ll say right away that my announcement here does not do this book justice. As I wrote in my somewhat critical review of Rohr’s previous book, The Divine Dance, I have great appreciation for Father Rohr and his Franciscan sensibilities. His peace and justice activism rooted in a vision where “everything belongs” in the “naked now” means a lot to me. When he cites Merton and the other mystics, I’m truly glad and nicely challenged. I want to like his work; I think I’m we’re often seeking similar vistas but using different words and ways into the experience; as we implied above in announcing the new Kuyper volume on “common grace” I am thrilled by the notion that God upholds all things, inviting us to a sacramental worldview, where we see God’s presence in the mundane and God’s redemptive work all over. This image of the cosmic Christ — think of Colossians 1 or Ephesians 1, Rohr says, rightly — is part of our story, and when Rohr starts off citing Chesterton, say, I’m fully on board. But then without much of an argument or apology he falls into the heresy of pantheism saying dumb stuff, repeatedly, like “God loves things by becoming them.” He has goofy ways of talking about Jesus, about the Christ, about incarnation, about resurrection. I’m not too locked in (I don’t think) to rigorous, logical language about doctrine, which at it’s best should move to mystery and doxology and service. But it seems like Rohr just throws caution to the wind as if proper formulation doesn’t matter. Or maybe he really thinks his formulations — that Jesus on Easter morning was mostly Light — are right. Gosh, I hope such missteps are just poetic license and hyperbole. His central thesis — that Christ is “another name for everything” — just isn’t theologically adequate or nuanced enough. I know many like to differentiate between Jesus and Christ and I get that, but he is sloppy about it all — at least so far in my reading. I find sentences that are annoying because they aren’t clear (followed by a scolding that in this book we have to withhold egoic judgements when things aren’t clear. Man, what editor did he bribe to get away with that free pass?) Most readers aren’t exactly the control freaks he implies we are for wanting a sentence to make sense. I could even live with all the sophomoric Capital Letters if it helped bring clarity and brilliance. But sentences about Infinite Primal Sources and Jesus being a Third Someone and the Logos of John being the Primordial Pattern doesn’t do it for me. Maybe it will for you. I’m still reading this, and there is beauty and mystery and wholeness and a trajectory here that is more right than wrong, I think. I appreciated Teilhard de Chardin in the ’70s and Matthew Fox in the ’80s and while I don’t get Ken Wilber, I have friends that think he’s great. Fair enough. Brother Rohr draws on the Orthodox tradition, too — deification and such — which isn’t as useful for some of us as he seems to think, nor as self-evidently correct. But for liberal Protestants who haven’t had much of an enchanted, all-of-life-redeemed hope, this might help and fire them up. And for fundamentalists filled with hell-fire and anxiety, it would be a corrective, although no fundamentalist will be convinced by it since he doesn’t speak their language. My hunch is that those who are inclined to like this sort of thing will love it, and those who are skeptical will remain so. It’s a shame, because there is insight and provocation here that could help. I name it here suggesting you give it a try. I’m sure some of my conservative friends will think we’re wrong to even carry such a theologically convoluted book. I disagree. There are good lines here to ponder and important notions to consider. It would make a good thing to meditate on but, better, to talk about with others. Rohr would like that, I bet, as different sorts of folk come to the table in open-mindedness to grapple with Big Ideas in this Mootable Treatise. That could be fun, eh? Seriously, check it out. Again, this isn’t the first book to suggest that, not even from the conservative theological end of the pew. But it may be the most beautifully written, the wisest, the most interesting. Mystical friends like Marlena Graves (author of the fabulous A Beautiful Disaster, a book that obviously knows something about befriending paradox) says it is “wise and compelling.” Lovely writers like Hannah Anderson (author of All That’s Good) rave. She suggests it leads us to the Divine! Highlights our call to faith that invites us to form a sacred, expectant circle around one tiny word — and… This book is a subversive invitation to make peace with the paradoxical way of Jesus. 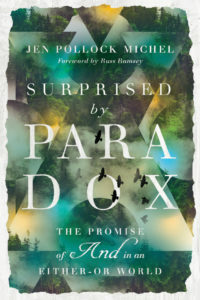 I hope you know Jen Pollock Michel’s other books and DVDs. We love her profound and engaging teaching with almost memoir-like stories in Teach Us To Want about desire and ambition and her wonderful Keeping Place about home, home-making, a sense of place and hospitality. They tend to be used in woman’s groups but we recommend them highly for one and all. Jen Michel is the sort of practical, down-to-Earth theologian we need. She draws on exceptional sources — Fleming Rutledge, N.T. Wright, Todd Billings, Alexander Schmemann, Eugene Peterson, Ellen Davis. From a section drawing on Salile Tisdale’s Violation to an extended riff on Chesterton to chapters with titles like “The High Treason of Hallelujah,” this is stuff your going to want to read and discuss. There are good study and conversation questions after each of the four major parts, Incarnation, Kingdom, Grace, and Lament. Restless Faith: Holding Evangelical Beliefs in a World of Contested Labels Richard Mouw (Brazos press) $19.99 Okay, I’ll just say it: Mouw is my favorite writer in the genre of theology — he makes complex stuff really clear and explains why it matters — and is one of the very best (balanced, careful, thoughtful, wise, generous) when it comes to applying classic Reformed theology to the world and its cultures and issues. If he calls himself a Kuyperian, I call myself a Mouw-ist. That was a long way to go for a joke I heard from somebody else (maybe Gideon Strauss of the Institute for Christian Studies) but it was worth it. We should all be Mouw-ists — generous, thoughtful, gracious, Biblically-attuned, clear about our own faith traditions and yet open to others. We did an announcement about this last winter before it came out and took a bunch of pre-orders. It made me as happy as anything, knowing this reasonable meditation on core convictions of orthodox Christianity (granted, sung in Reformed and reformational keys) was being read by so many. Thanks to all who ordered it from us then. 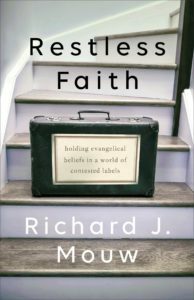 Part of this book retells some of Rich’s own “restlessness” with the phrase “evangelical.” He was an early Presbyterian conversation partner with Mennonites (a move that literally was life-changing for me, realizing I could hold the Reformed worldview and the Mennonite pacifist impulses together) and he partnered early on as a Reformed evangelical philosopher with heros of mine like Jim Wallis and Ron Sider. Again, his writings from Grand Rapids in the 1970s where he taught at Calvin College with Nicholas Wolterstorff and other socially-engaged and culturally-relevant philosophers, were essential for me. Like man, I was glad for the evangelical truisms of simple faith, the assurance of salvation through faith, a relaxed piety; we “Jesus People” even used the phrase “born again” until the Christian right swiped and fouled it; we’d happily commend a “personal walk with Jesus” even as we were a bit uneasy with how that sometimes played out and what others maybe meant by it. (It’s no wonder that many of those whose faith came alive in the great awakening of the late 20th century ended up studying Catholic monks and embracing contemplative spirituality and liturgical church practice.) Beth and I were both raised in mainline denominational churches and hold membership in conventional mainline congregations, we w’eve been restless with our evangelical movement, even though we are stuck in the middle of that subculture as Christian booksellers. We are restless with progressive, liberal theology and we are restless with conservative evangelicalism. Mouw walked this way before we did, and his report on holding these tensions together from a solid Biblical perspective is sensible and good. He told more of his own life story in a memoir called Adventures in Evangelical Civility but here he explains what the label “evangelical” means and why it matters and why he continues to use it. In a way Restless Faith is an excellent theological primer for our times. Mouw not only explains his own restlessness with evangelicalism from the vantage point of his on-going conversations with folks from across the theological spectrum (few are as ecumenically aware as he is) but also — and this is important! — why he still clings to the word, the tradition, the movement. That is, even though he disapproves of how the far right (political, socially, and theologically) have captured and co-opted the broad tradition that was once known for Billy Graham and Carl Henry (and now is know from Jerry Falwell and Donald Trump) he still holds to that theological identity. This interesting book is a much needed reasonable voice and will explain much you should know about basic Christian convictions and robust, sensible discipleship. I very highly recommend it. In Restless Faith, Richard Mouw stakes out a thoughtful defense of evangelicalism as a spiritual and even intellectual tradition. Always compassionate, Mouw’s voice is a vital corrective to the invective that distinguishes some prominent evangelicals. You don’t need to be religious yourself to appreciate his earnest pursuit of truth and meaning in our divisive age. Rich Mouw has contributed much wisdom to Christian faith and life over many decades. This wonderful book continues that gift. With characteristic honesty, humility, and hope, Mouw acknowledges the restlessness of his own evangelical identity but then points a way forward to a generous and faithful expression of that identity. For other restless believers, this book contains needed ingredients: some correction, some coaxing, and plenty of celebration for God’s good gifts. 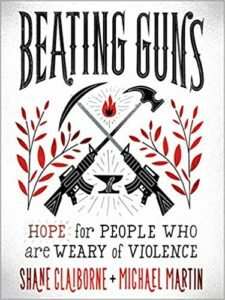 Beating Guns: Hope for People Who Are Weary of Violence Shane Claiborne & Michael Martin (Brazos Press) $19.99 This book has been called “timely, relevant, and necessary.” It is a study of gun violence from the point of view of a simple-living, urban activist. Shane — whose Irresistible Revolution is a must-read and whose Jesus for President grows more timely every day — lives in a brutally rough part of Camden NJ and has experience drive bys and gang violence and police shootings (that is, police shooting his black neighbors) more than probably anybody you know. He grew up a Southern Baptist boy and still retains a vibrant and happy style of speaking about Jesus. I suppose he grows restless as Mouw does, but because he shares life with the wounded and hurting and sees the glories and dignities of the poor, his restlessness is more with apathy and carelessness and those who have denied the basic teachings of Jesus. That is, he takes the Bible pretty literally when it talks about peacemaking. And so, Shane — who knows how to handle a rifle because he grew up hunting, after all — is just energetic and crazy enough to find some guys who know something about metal working and they’ve learned to forge guns literally into garden tools. 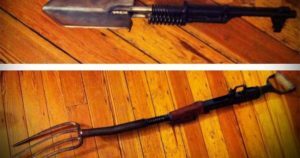 He is on tour now with his co-author Michael Martin, Mennonite pastor turned blacksmith (and now director of RAWtools Inc.) They literally turn guns to garden tools, instruments of death-dealing into instruments of feeding and life. It is practical application of Bible principles, performance art of Biblical teaching, prophecy enacted, a Christian imagination of creative problem solving shown, not just told. This book is the story behind this tour — how they got fed up with mass shootings and urban crime and a religious culture that makes a fetish out of violence and victory. It explains the problem but more, it shows how they came up with ideas of how to respond. Finally we have a winsome, reasonable approach to an issue that usually generates far more heat than light. 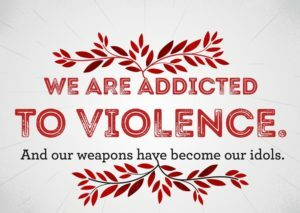 More Americans have died from guns in the US in the last fifty years than in all the wars in American history. Though the people of the United States total 5 percent of the world’s population, they own almost half the world’s guns. With well over 300 million guns in the US, there are more guns than people. America also has the world’s most gun deaths–including homicide, suicide, and accidental gun deaths–at 105 per day, or about 38,000 per year. I might add that this book is nicely designed, on good stock paper that allows full color pictures and some nice graphics. I’m glad Brazos spent extra to make this book a beautiful witness to this good work. It is a clarion call, aimed at our hearts, our minds, and our actions. There is nothing like it — if you worry about this issue, you’l take heart. If you tend to resist thinking about this or are alarmed by those talking about gun danger, I challenge you to read this. It will help us all. 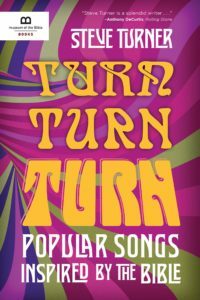 Turn, Turn, Turn: Popular Songs Inspired by the Bible Steve Turner (Worthy Books) $24.99 I have been wanting to tell you about this book for weeks now. Turner is an amazing rock critic and Christian thinker about pop culture. His books should be widely known and shared, especially among younger creative types for whom his work could be a life-line.) Oh how I wish we could sell more of his must-read books Imagine: A Vision for Christians in the Arts and Pop Cultured: Thinking Christianly about Style, Media and Entertainment which explores very thoughtful Christian principles for all kinds of pop culture pressures and joys, from fashion to video games to advertising to comedy to TV watching. I hope you recall how much I raved about his spectacular book (a must for any Beatles fans) called Beatles ’66: The Revolutionary Year. Steve Turner is a splendid writer whose deep and ranging musical knowledge blends inextricably with his understanding of how songs can touch — and save — people’s souls. Those virtues come fully into play in this book, which taught me a great deal and moved me even more. Holy smokes, did you get that? Anthony Rock and Roll DeCurtis says this book taught him and moved him! You should know this, though — the cover, designed, I guess, with the “Museum of the Bible” popular culture display in mind, has this obvious ’60s flower power thing going on. That’s fun. But this book includes song reviews of songs from long before the 1960s and include every decade since. Turner wisely explains the Biblical influences of songs by Noel Paul Stookey like 1971s “Wedding Song (There Is Love)” but also “After Forever” by Black Sabbath. It includes studies of Bowie’s “Word on a Wing” from 1976 and “Adam Raised a Cain” from Springsteen’s ’78 classic album. I love that he has Cockburn’s 1981’s “Dweller by a Dark Stream” and a couple of good 80s Dylan songs. Obciouasly he has U2’s “40.” You can see what Prince was up to in 1987 (“The Cross”) and some good ones from the 90s, from Don Henley, Michael Jackson, ALice Cooper and “New Test Leper” by R.E.M. (1996.) Whitney Houston relased “Joy” in 1996 and Turner’s got it. He of course does a Lauryn Hill song from ’98 and Moby’s “Run On” from 1999. Turn Turn Turn is unfortunately named and the pop-art cover makes one thing it is about the late 60s, but Turner covers songs from pre-World War II and “Can I Get A Witness” from Marvin Gaye, released in 1963. And he has almost 20 songs from the new millennium, from Sting and Sufjan Stevens to Kanye West and Matisyahu. He looks at the Killer’s 2006 release “Why Do I Keep Counting?” and “Judas” by Lady Gaga. Of course he looks at Chance the Rapper and Kendrick Lamar, but he also looks at Katy Perry, Coldplay, Stormzy (from 2017) and Mumford and Sons. Turn, Turn, Turn is a blast. – The book of Ecclesiastes has been a great inspiration on popular music including the song “Turn, Turn, Turn” by The Birds, the Pink Floyd album The Dark Side of the Moon, and “Desperado,” the 1973 hit by The Eagles, among others. – Paul Simon once advised a young prospective lyricist to raid the Bible for memorable phrases. “Just steal them,” he said, “That’s what they’re there for.”There’s no question that Scripture has influenced music since the first ever song was penned. In Turn! Turn! Turn! author and music connoisseur, Steve Turner, takes an in-depth look at the lyrics and cultural context of 100 of the greatest songs from the 1930s to today to reveal an often overlooked or ignored strand of influence in popular music–the Bible.Indeed, some of the “greats”–including Bob Dylan, Leonard Cohen, Bono, Johnny Cash, Sting, and others–have repeatedly returned to the Bible for such sustenance, as well as musical inspiration and a framework with which they can better understand themselves. “I hope the book prompts, provokes, and intrigues as it reveals this often-hidden history,” writes Steve Turner. You’ll never listen to your favorite song or popular tune the same way again after discovering how the Bible has influenced music. 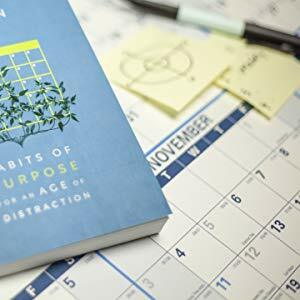 The Common Rule: Habits of Purpose for an Age of Distraction Justin Whitmel Earley (IVP) $18.00 We have lots of books here at the shop about self help sorts of things, from time management resources to books helping you get your house in order. Many are useful, some are more profound than others. None of us want cheap promises or easy answers. 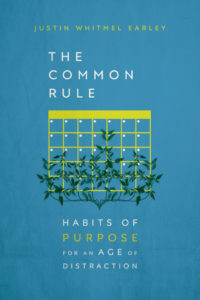 This recent book, The Common Rule by Justin Earley, is nothing short of brilliant, and I hesitate to promote it as a self help book as those sorts of personal growth titles are sometimes dismissed. Unfairly or not, some book buyers tend to assume that such books are cheesy or formulaic. We’ve followed Justin Earley on-line a bit over the last year or so and have friends that know him well. We can vouch that he is a solid, thoughtful guy and this book is very rich and wise. It is inspired by classic theology and ancient spiritual practices but is savvy about modern lifestyles and what forms habits that help us flourish. Want some help saying yes to life-affirming, good things? Want some help resisting troubling or life-sucking habits? This simple graphic, with four daily and four weekly habits (some affirming, some resistant) can provide a way to think about and measure your growth into better life habits. Although I’m a church leader who has known the Lord for decades, I struggle to find space in my days to actually abide in Christ. Instead, I’m tethered to the demands that barrage me through my smart phone. The Common Rule offers a practical way back—not only for individuals but also for churches and small groups.